This piece is part of a project where Jason and Caleb analyze the top eight Ducks prospects for the 2015 NFL Draft. The prospects will be listed in the order in which they are projected to be drafted. Enjoy. Overview: Was there ever any doubt who would be number one on this count down? 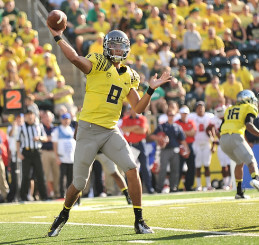 There’s not much to say about Marcus Mariota that hasn’t already been said. For starters, the guy is a walking trophy case. Last year, he won the Heisman Trophy, Maxwell Award, Davey O’Brien National QB Award and Johnny Unitas Golden Arm Award, while also being selected as the Walter Camp Player of the Year, Associated Press Player of the Year, Walter Camp first-team All-America and Associated Press first-team All-American. And, ironically, you could tell he had no interest in any of it. ESPN Football Analyst Jon Gruden summarized Mariota perfectly when he said, “He is very much not interested in himself. He could care less about his individual achievements.” Sadly for Mariota though, the awards are realities he had to endure after one of the most prolific campaigns in college football history. 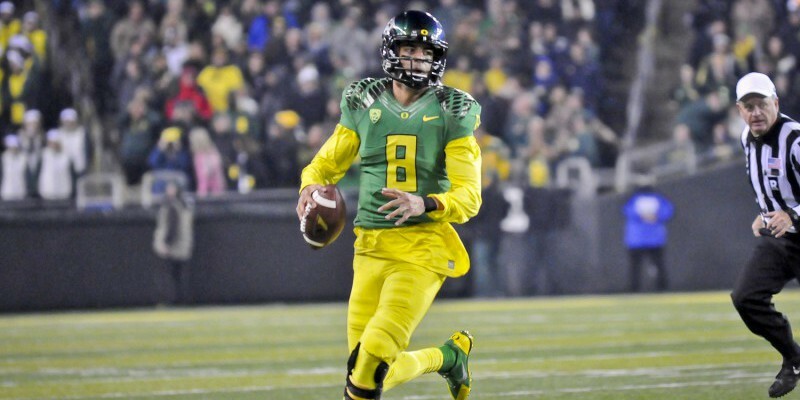 Mariota produced one of the best seasons in college football history in 2014. When revisiting Mariota’s season last year, it’s remarkable to note there isn’t a single point of concern, at least from a statistical standpoint. He set career highs in completions (304), TDs (42), Yards (4,454) and QBR (181.7). He also tied his career low of four interceptions, and was .2% off of tying his career high for completion percentage (68.5%). The guy was a freaking machine. With Mariota leading the way, the Ducks finished the season 13-2 on the back of the most dominant offense, in terms of total yardage, in CFB. Perhaps the most telling stat of all though is his career passing efficiency rating. The statistic, meant to measure a QB’s total efficiency, has been measured since 1954. In its 61 years of existence, only one QB, Sam Bradford, has ever had a higher rating than Marcus Mariota. Strengths: There could be a book written about Marcus Mariota’s strengths, but for sanity’s sake we’ll try to condense it into a paragraph or two. As a passer, Mariota is ideal. He’s got a quick release, a strong arm, and a frame to add some extra muscle if need be. However, it’s no secret that his strengths aren’t as a prototypical pocket passer. Where Mariota truly excels is on the run. He has freakish accuracy on roll outs while maintaining a smooth delivery. His mobility outside the pocket stretches defenses out and forces them to react differently than they do to standard pocket passers. Because of this, Mariota makes difficult plays look easy. His speed is elite too, and with it he can get to the corner on most defenses and pick up first downs when a play breaks down. He’s very similar to Russell Wilson, but five inches taller. Weaknesses: Okay, so maybe he’s not perfect. Everyone has flaws, even Mariota. Major concerns exist about his ability to make pro-style reads, coming from an offense where the reads are very basic. He also showed poor pocket presence, which in college wasn’t important because he could just leave the pocket and everything would be fine. In the NFL he will need to work on his ability to step up and move with the pocket. Cutting down on his scrambles will help Mariota in the NFL. Also, although his physical attributes are great, it’s simply impossible to continue the exact style of play he did in college. 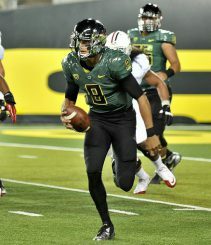 Guys are bigger, better, faster, and stronger at the next level and as a running QB, Mariota’s chances of getting injured sky rocket. He won’t have to change his style completely, but cutting down on his scrambles will help him to sustain a successful career.